It never takes much. Tubbs started when some power lines blew over. All it took for Carr to roar to life was a flat tire. Thomas was born of a utility malfunction. Camp was probably the same. Their beginnings almost don’t matter, since the story of each of those historic wildfires, and all the fires raging right now, and all the fires yet to come, is one of rapid, voracious growth. Something tiny evolves into something terrifying, and thousands of Californians’ lives are thrown into disarray as the unsparing flames eat everything in front of them. The rain comes too late, heroic firefighters risk their lives to quench the blaze, and communities eventually pick up the pieces. Everyone moves on, but no one forgets. You’ve read this wildfire story before. It’s one of human fragility in the face of nature’s ruthless power that turns into a narrative about the courage and collectivism taken to finally overcome the fire. It’s a true story, and it feels good, because it posits that we are ultimately in control of an enemy that seems so uncontrollable. But what if it’s like this all the time? What if fire season never ends? What happens when the fires are too fast to beat? What sort of life can Californians hope for if the state is a cauldron of smoke and death? Vegetation is only getting drier, the temperatures are only getting hotter, and the fires are only getting more explosive. The Camp Fire is the new normal. People have wondered for years what the start of climate change would look like, what form the first harbingers would take. This is it. It’s not any new, unforeseen type of disaster, but in more frequent and more powerful repetitions of the ones we already know. It’s increasingly devastating hurricanes, and cyclonic California wildfires. There are more of them, and at times of the year they’ve never happened before, and in places that were previously untouched. It is a rapidly escalating series of natural disaster after natural disaster, until it becomes clear to everyone that we have no control whatsoever. And the progression only goes one way—it will only get worse. One week ago, around 27,000 people lived in Paradise, a small mountain town near Sacramento. Now it’s essentially gone. At least 48 people are dead, and we’ll be lucky if the final death toll stays under 200. Fires are not supposed to move as quickly as the Camp Fire did when it roared into town on Thursday at 80 acres a minute and burnt people alive in their cars as they tried to escape. A large group of people, including a 90-year-old man, had to float in a frigid reservoir to escape the flames. Ernie Foss, who has been bedridden by a chronic disease, almost made it to safety with the help of his caregiver Andrew Burt, but he was unable to get away from the flames. Burt is still missing. Diane Franklin had to lay in a cold stream inside the blaze for hours and continually keep her body and hair wet so they wouldn’t start burning. Brad Weldon couldn’t get his geriatric mother out of their house, so he stayed behind and kept the fire back with a hose. The Camp Fire is not the largest fire in state history, but it’s already the deadliest and the most destructive. The stories are heartbreaking, and whatever rebuilding happens can only ever be partial. And there are second-order effects too. The bulk of Northern California’s population has been living under horrid air conditions that make exercising and even going outside dangerous for one’s health. The 10 million or so people that live in the Bay Area and Sacramento have been breathing air deemed “Unhealthy” to “Very Unhealthy” for six uninterrupted days. This is not losing a house or a family member, obviously, but the bad air is real and its effects can be permanent. As an asthmatic, I’ve been obsessively monitoring the air quality, which is only finally starting to clear up now. The poisonous air has forced me to seal myself inside my apartment for six days, refreshing the map at the Bay Area Air Quality Management District website every 20 minutes and hoping for a respite. When I have gone outside, with a mask on, the empty streets are shrouded in an orange haze. It feels apocalyptic. Everyone I talk to feels dizzy and lightheaded all the time. We’re the lucky ones. Maybe you haven’t read that much about the Camp Fire, or maybe you confused it with the Mendocino Complex Fire—which burnt half a million acres this summer—or the Thomas Fire—which burnt 300,000 acres last December (December!) and set the stage of Montecito’s horrifying mudslides that killed 21 people a month later—or the Carr Fire—which started at the same time as the Mendocino Fire and got half as big—or the Tubbs Fire—which killed 22 people in wine country last year—or the Woolsey Fire, which is still happening in L.A. right now. Last year’s fire season was the worst in state history, until this year passed it. Next year will probably surpass 2018, and then 2020 will be the new king. If the Camp Fire doesn’t stand out, even though it’s killed dozens of people, it’s because we now live in the era of the megafire. Fire has always been a part of California’s ecosystem, especially in coastal chaparral and mountain forest regions. They are supposed to burn every century or so, clearing out the denser and older vegetation to set the table for a new cycle of growth. What is happening now is an acceleration of a natural process by several orders of magnitude. As many scientists have pointed out, it doesn’t really rain much California anymore, and so all that gnarled vegetation in the mountains has dried out and become fuel. By this time in a normal year, the weather has changed and it’s started to rain, so even if easterly winds blow out to the coast, fire can’t rip down canyons like it does now, since everything is too alive. Without any rain, the typical wind shift has turned the Camp Fire into an inferno. 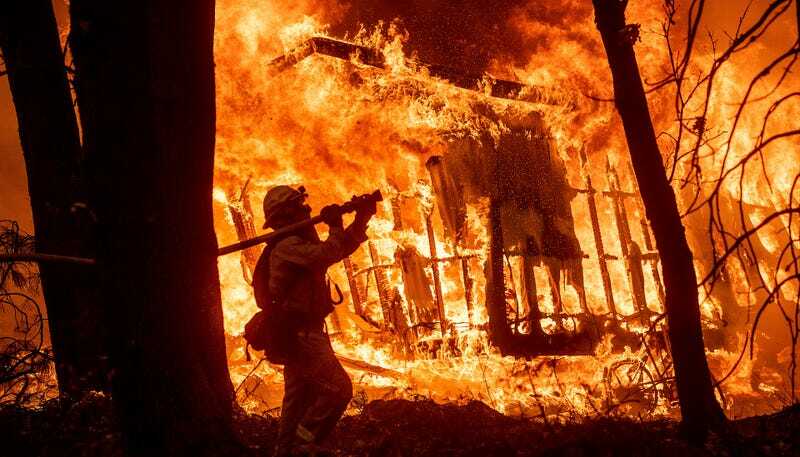 Global warming has made the summers longer, hotter, and drier, which means that the weather patterns that used to quell fire season are now the same factors that exacerbate it and turn late-year blazes like the Camp and Thomas Fires into unholy anomalies of destruction. The Thomas Fire that destroyed Ojai and the ravaged hills east of Santa Barbara feels like it happened years ago, but all those people in Montecito died this January. The town will never go back to normal. And neither will the state. We’ve had rainy years in the recent past, but the medium-scale trends show a shorter, more concentrated rainy season that leaves vast tracts of the state dry and vulnerable later into the year than they should be. The drought is not going away, and Californians, particularly in the ever-expanding suburbs, are continuing to move into hyper-vulnerable areas. Global climate change can be thought of as a “threat multiplier” that exaggerates the scale of what’s happening. It’s not for me to say what sort of paradigm shift is required to reorient the way we conceive of and respond to disasters like this, but it will take collective action and a new understanding of the scale of the problem. If there is hope to be found, you can find it in the army of firefighters battling the blaze, or the groups distributing N-95 masks in San Francisco and Sacramento, or the surfers in Malibu ferrying precious supplies to shore from boats. The granular lived experience of communal support is really the only thing keeping the dread of a desperate, smoky, and short future at bay. We are all we have, even if that’s no longer enough.